BOOKMARKDirect for quality paper at unrivalled prices ! An ultra smooth white paper offering excellent colour reproduction for graphics and images and guaranteed for use on all office equipment. It produces superior print quality in offset and digital printing and guarantees extremely sharp and well-defined images and text. 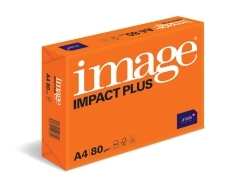 Image Impact Plus employs ColorLok® Technology for great print results. It is FSC certified.